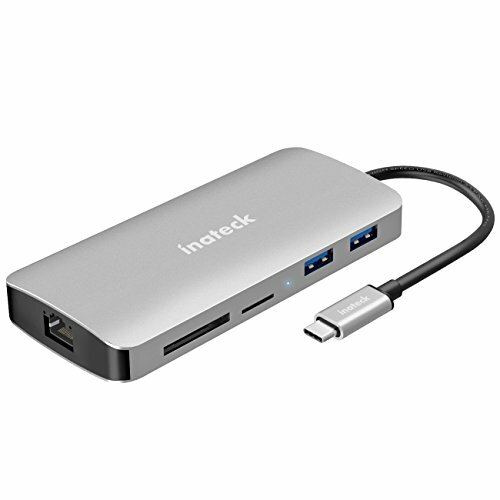 Multi-Port USB C Hub: Extend your USB C port to 2 USB A 3.0 ports, 1 HDMI port, 1 Type C charging and data port, 1 Ethernet interface, 1 SD card reader and 1 micro SD card slot. Satisfy various needs at the same time! Universal Compatibility: It can operate with all Type C laptops and tablets, including MacBook 12 Inch, MacBook Pro 2016, Dell XPS series etc. Compatible with Windows 7/8/10, Mac OS X, and Android. DC power port is installed to supply power for the hub when using with devices which require large energy consumption. 4K HDMI Video Output: Transmitting video data with resolution up to 3840x2160@30Hz. Enjoy watching real-time HD images from your computer with this amazing hub (video transmission requires the output device to support DP Alt mode). Multi-functional USB C Port: Supports PD3.0, 60W (20V, 3A). Two-way power supply: supply power for computer by connecting the charging port, and for external devices by connecting corresponding ports. Gigabit Ethernet Interface: Backward compatible with 100/10Mbps Ethernet. Connect your device to stable high-speed wired internet, which relieves you from the trouble of interference associated with wireless internet.